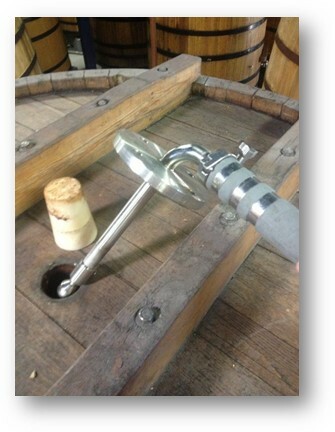 In December I wrote about tips on barrel repairs and maintenance. I was happy to hear the tips in the article had helped a few of my fellow brewers! A few weeks ago I was scrolling through some posts on a forum and came across a thread on barrel cleaning. Chase Healey of Prairie Artisan Ales made a comment along the lines of “5 different brewers will tell you 5 different ways.” He is absolutely right, everyone has their own process and there really is no right or wrong answer. 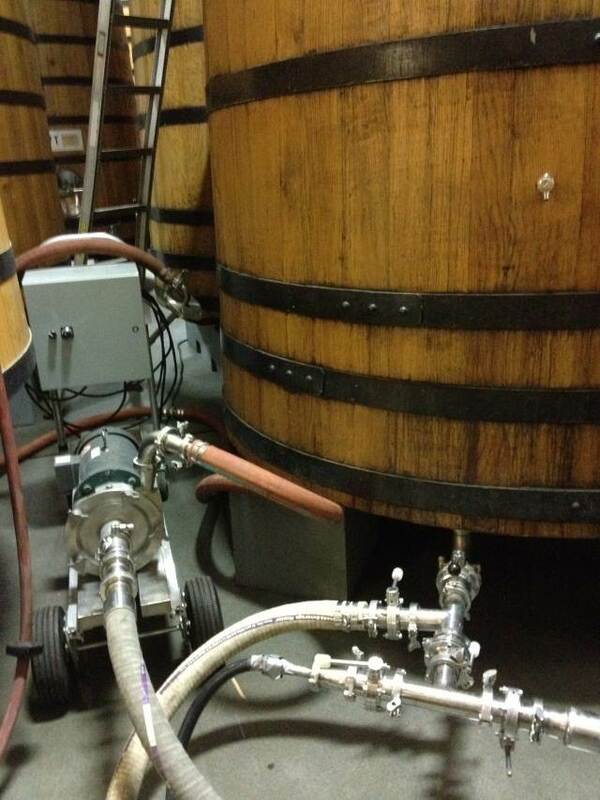 The best way to clean or store barrels is the way that works for your brewery or home brewery. But with so many schools of thought…How do you get started figuring out what works best? I listed my process below and reached out to a few brewers I consider to be the best in the world at barrel brewing who graciously shared their advice. I prefer to start with a cold water rinse to remove any debris. 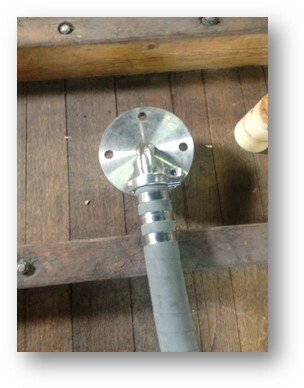 For Foeders I utilize a block and bleed matrix, pump, and high pressure spray-ball. Then a cool water rinse. Fill partially with cold water and add Citric acid solution at (5 g/L)… Recirculate to neutralize, drain. • Fill partially with cold water, add Potassium Metabisulfite – solution, 2 g/L. ERIC- I would first determine how well everything sits in the hoops. If gaps between staves are minimal then cool water should work fine. Warmer water will hydrate faster but you have to watch that you don’t go too hot for too long or you’ll degrade the cell structure of the wood itself. That’s a leak that can’t be repaired. I’ve seen recommendations for water as hot as 160°F but I usually keep it below 100°F. Again, if the staves are tight and the leaks minimal, cooler water works. That might take a bit longer but the risk is lower. Small barrels generally come in nice and tight. We really only deal with whiskey barrels from Leopold Brother’s and those are well kept and usually only dry for half a day before we fill them with beer. Vinnie Cilurzo (Russian River Brewing)- We actually never hold barrels empty. If they are empty, we either fill them immediately or they go into the throw away pile. I guess we have this advantage being in the middle of wine country with access to barrels. I take this stance because even after cleaning a barrel with our pressure washer there is still some beer, bacteria, & alcohol left in the wood and as it is exposed to air the chance of the growth of acetic acid is greater. Of course one can use sulfur sticks to eliminate the oxygen but again, when one has access to barrels like we do, it is just easier to grab some fresh barrels. Jean Van Roy- (Brasserie Cantillon)- We clean our barrels first with steam and then a rotative head linked to high pressure water. Then with warm water and chains added into the barrel. For this last operation, we put the barrel on a rotative machine and we let it turn for 20 minutes. The barrels filled in the next 2-3 days are used fresh. For the ones we have to keep for more than 3 days, we burn a sulfur stick inside to avoid moisture. Ron Jeffries (Jolly Pumpkin Artisan Ales)- We try to avoid leaving them empty. Ideally we fill them directly after emptying, or the next day. If we do need to hold them empty longer, we just bung them up after cleaning – empty; and re clean before use. Most holding solutions worry me, as they kill off our resident bugs, and soak into the wood. 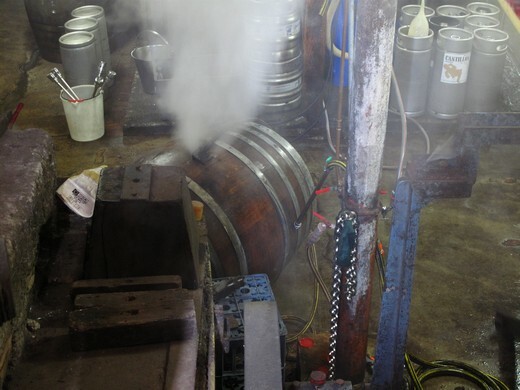 Anyone who’s made a beer in a freshly dumped barrel can tell you what’s in the wood will come out into the next liquid put into the barrel, namely in this case replacing a bit of your beer with the holding solution. Hot water fill off our HLT to check for major leaks or defects if a barrel looks suspect. If the barrels look good when I’m ready to use them, then many times I’ll just go right into the barrel so I can keep as much barrel character in the barrel as possible. If I’m emptying a barrel that had funky beer in it and I know it wont be used for a couple weeks then it gets a hot water rinse to clean out the left overs then a 1/4 to 1/3 full with warm water along with a mix Citric acid and Potassium Metabisulfite. About 1/4 cup of Citric and about a 1/3 cup of Potassium Metabisulfite per 12-14 gallons makes a nice holding solution or solution inside the barrel.